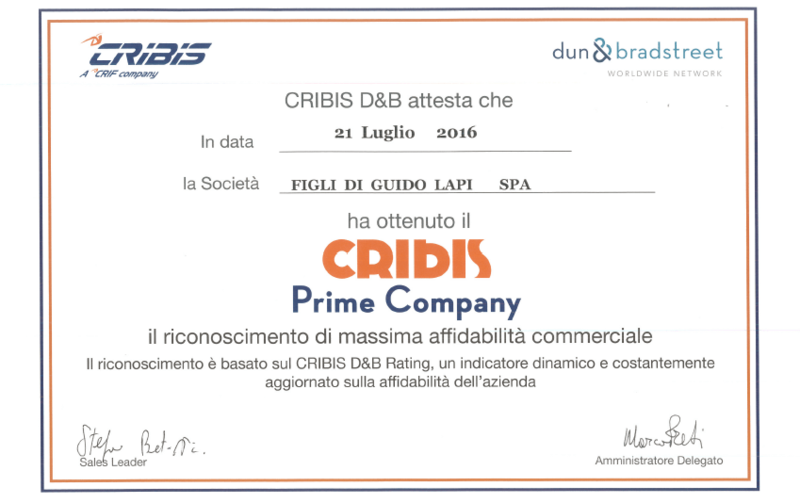 For the third two-year period in a row, Figli di Guido Lapi reaches the maximum rating as PRIME COMPANY by Cribis – Dun & Bradstreet, a leading company in the service sector of economic information, credit scoring and solutions for business decisions. The prestigious recognition was also granted to other 6 firms of the Lapi group: FGL Internation, Toscolapi, Finikem, Lapi Gelatine, Gi-Elle-Emme Tannery and Lapi Group. The title of PRIME COMPANY certificates the maximum trade reliability of the firm and it is based on the Cribis D&B Rating, which is a dynamic indicator constantly updated, based on authoritative data and information. Figli di Guido Lapi: the partner you can count on!